Sorry for the lack of posts recently. I have some major life changes happening in the next weeks, so unfortunately posts will still be sparse until mid September or so, possibly even longer. Writing this blog has made me realize how little I remember of the geography lessons I had in school. Not only are there two countries that can be referred to with the adjective “Dominican” and three Guineas in Africa, there are two Congos, both located next to each other in the Southern Central Africa. The much larger Democratic Republic of the Congo (formerly known as Zaire) is completely landlocked, while the smaller Republic of the Congo also has a tiny bit of shoreline on the Atlantic coast. However, the latter has a GDP per capita over a decade larger than the former, which has the second lowest nominal GDP per capita in the world (the lowest is in Burundi). Enough of the geography lesson and onto the food. Congolese cuisine is similar to many other African cuisines: a starch like fufu is eaten with a stew. Other popular starches include taro, yam, corn, rice and kwanga, a fermented bread made of cassava. The Congolese also eat a lot of cassava leaves and other greens, okra, mushrooms, corn, rice, sweet potatoes, pumpkin, tomatoes, chili and peanuts. They do eat goat, fish, insects and other meats, but not that much because of cost issues. This particular dish is featured on many recipe sites and must be the one of the simplest to ever appear on Vegventures. Most versions only contain three ingredients, but I added salt, because I felt it was needed. Since African people use wild mushrooms I used some parasol mushrooms from my freezer, though I think that in the end white/button mushrooms might have worked better, after all. 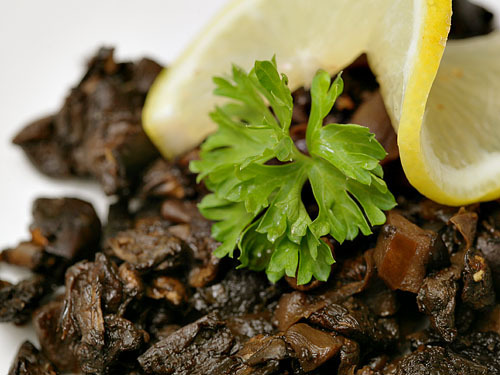 The original recipe calls for frying the mushrooms in oil, as most mushroom recipes do. In reality you get better results if you first fry the mushrooms until they have exuded their juices and dried out (you can initially add a few splashes of water if needed) and only then add the oil. For more mushroom tips see my article How to Cook with Mushrooms. Fry the mushrooms until they have shrunken down and are juicy. Add the oil and continue frying for a bit. Add the lemon juice and salt and simmer as needed. This entry was written on August 10th, 2010 by Maija Haavisto and filed under Africa, Side dishes.